According to the announcements by the Crimean Ministry of Industry Policy, the peninsula should get its first solar collector production unit soon. The government has plans to establish a solar collector and heat pump factory in the industrial area of Feodossija, an article on the Kryminform website from 6 November 2015 stated, referring to a press release by the former Crimea’s Minister of Industrial Policy, Andrei Skrynnik. The largest local solar water heater supplier Afros imports collectors from neighbouring countries and focus on system installations. The photo shows one of the solar references from the Afros website, a residential installation in Alupka, near the peninsula’s southern coastline. Afros has almost 15 years of experience in importing collectors from Europe as well as assembling and installing solar thermal systems for different applications. 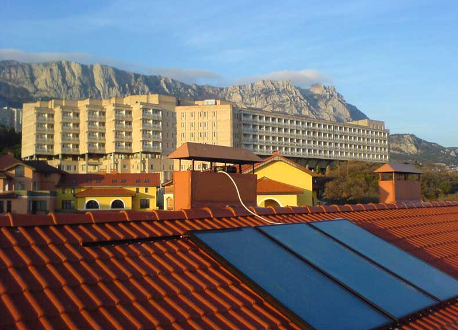 A second former supplier of solar thermal systems, Crimean Heat Company, produced its own flat plate collectors until 2011, but then switched to imports as well and even stopped business recently. Currently, the Crimean government is looking for a company that could offer its capacities for the production of the new solar collectors and heat pump systems. According to an announcement by the Ministry of Industrial Policy reported on Russia’s Channel 1, the construction of the factory is scheduled for May/June this year and is part of the existing state programme Energy Saving and Energy Efficiency in the Republic of Crimea for 2015-2017. The aim of the energy programme is to increase the share of renewables in the overall generation of electricity and heat across Crimea to between 3 and 3.5 % by 2017, compared to 1 % in Russia. During a Channel 1 news report, Crimea’s Deputy Minister of Fuel and Energy, Yevgeny Demin, said that the development of solar thermal energy had been unprofitable until now because of subsidised electricity tariffs, which were at Russian Rouble (RUB) 1.25 RUB per kWh (USD 0.018). The recent energy blockade of the peninsula by Ukraine, however, may lead to strongly rising power prices during the next several years. Additional factors for the upcoming price hike could be the planned stop of further energy purchases from Ukraine and a shift to suppliers from mainland Russia. It is a political decision: Since the largely unrecognised annexation of Crimea by the Russian Federation in March 2014, the Republic of Crimea, including the city of Sevastopol, has been part of the Russian Federation. Demin has also added that Crimea showed favourable conditions for the development of renewables. Unlike in other regions of Russia, the majority of the peninsula’s energy demand came from the local population, whereas the number of large enterprises in the region is relatively small.